Here goes the authentic delicious recipe to prepare your own flavorful, aromatic sambar powder at home. Sambar is one of the prime dish in Indian cuisine. 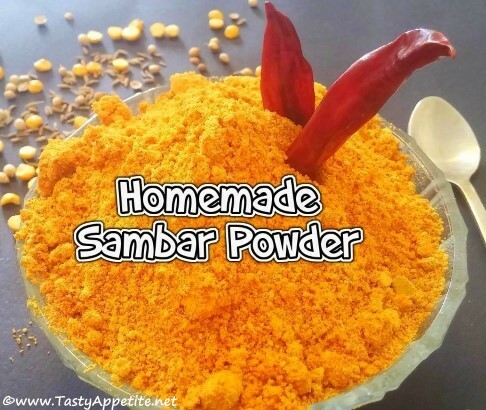 You'll never buy readymade sambar powder once you try this perfectly blended homemade sambar powder recipe. It stays fresh for 4 to 5 months by storing it in air tight container. Try this easy video recipe & enjoy the rich aroma of homemade sambar powder masala. Add red chillies and toss for few minutes in low flame. Add coriander seeds and toss until light brown. Next add gram dal (kadala paruppu) and roast until light brown. Add toor dal, urad dal, fenugreek, cumin seeds and toss for few minutes in low flame. Now add turmeric pwd, curry leaves, hing, salt and toss for few minutes. Grind it to smooth powder. Flavorful delicious homemade sambar powder is ready. Enjoy delicious sambar at your home by sprinkling sambar powder to it.